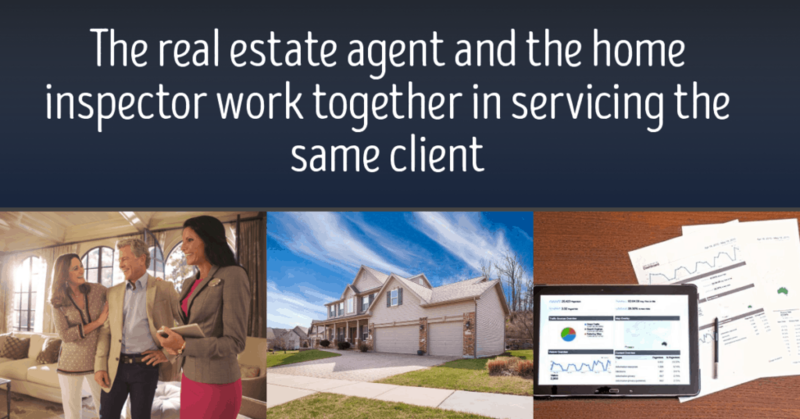 The real estate agent and the home inspector work together in servicing the same client; the homebuyer or the home seller. In the case of a homebuyer; both the real estate agent and the home inspector act in a manner to make the homebuyer aware of the advantages and deficiency of the subject property through disclosures and discoveries. Their goal is to protect the homebuyer’s interest and investment in the real estate property and to make sure that the property will not become an endless money pit that requires many repairs and updates after closing the real estate transaction. In the case of a home seller, the real estate agent wants to get the seller the maximum price possible for the property and avoid a potential risk of a buyer backing out from the deal after contract ratification. This can be accomplished by conducting a pre-listing home inspection where through the process of discovery, the inspector will find all deficiencies in the property that might affect the functionality, safety, and value of the real estate property. Armed with inspector’s findings in the home inspection report, the home seller can make a decision to repair and upgrade the property before introducing it to potential buyers; as the saying goes “First impression is golden”. By preparing the property for the market by addressing all deficiencies will help the real estate agent to market it with confidence and ask for the maximum possible price. In addition, it will encourage the potential buyer to offer a competitive price to acquire the property. Also, the homebuyer’s inspector will not be able to find major deficiencies. It is true that two home inspection report will not be the same, but if both were prepared by experienced and qualified inspectors, the differences will be minor and mostly a matter of opinion on items that do not affect the value or the enjoyment of the property. For a real estate agent to close the deal, it is important to get the property inspected by a qualified and state licensed home inspector. This way, the buyer can proceed with confidence to purchase the property and seal the deal. With NextDay Inspect, real estate agents are able to make efficient home ownership transition with a lower chance for any unpleasantries and potentially costly post-closing problems and lawsuits. It is important for the real estate agents to recommend the right home inspection service provider. You are about to make the deal and you want everything about the property to be known, good or bad. NextDay Inspect has the highest standards of training and knowledge in the home inspection industry. We don’t take potential problems with a property lightly just to please the real estate agent. Our inspectors will take the real estate agent into confidence and ensure that the report has everything mentioned. We, at NextDay Inspect, know the language and communicate well with the clients. We do not make exaggerations that might lead the buyer to back off and threaten to cancel the deal over minor and fixable problems, and we’ll never say “the sky is falling!” In other words, we state the facts as they are, without embellishments. At NextDay Inspect®, with the permission of our client, we give you a thorough understanding of the property you wish for your client to buy or sell. We let you know whether there is something wrong with the place; if it requires any repair or maintenance and also if all the major systems of the house are in good working condition. This allows you, the real estate agent, to take your client, the buyer, to the closing table with confidence, so they know exactly what they are buying. In the case of pre-listing inspection, this will allow you, the real estate agent, to present the property on the market with confidence and minimum liability of nondisclosure.